Hi Caroline, I experienced the same challenge with one of my children and used what Dreikurs called "the bathroom technique." I would go to the bathroom and lock the door. (If you decide to do this, be sure to have a good book to read.) The first time I did this I thought Dreikurs was nuts because my kids (two of them) followed me and were pounding on the door. One even slipped a note under the door. However, I stuck it out without saying a word, and pretty soon they went away. The next time they treated me disrespectfully (honestly can't remember what they did--it was so long ago--which shows how unimportant it is), I went to the bathroom again. This time the kids didn't follow me and they stopped their misbehavior. 2) When you follow through don't say a word. No lectures. No threats. Just let them have their feelings. It doesn't take them long to learn that if you say it you mean it, and if you mean it, you will follow through. This is a great model for them about how to treat themselves respectfully instead of trying to change someone else. Question on Logical Consequences and Avoiding Morning Hassles Answered Via Focusing on Soltuions Podcast. I will now be answering as many questions as I can find time for via Podcasts. Please let me know if you are willing to have your question answered this way. I can’t promise to get to all of them, but will certainly try. (So many wonderful opportunities, and not enough time.) Also let me know if I can use your first name. Many of you may have read the article on No More Logical Consequences—At Least Hardly Ever NO MORE LOGICAL CONSEQUENCES All of the Positive Discipline books now emphasize the importance of focusing on solutions. I’m still trying to get the word out. You may find the following question and Podcast answer helpful. Read the question and then go to Focusing on Solutions #43 (Avoiding morning hassles) PD-2007-06-07.mp3 to listen to the answer and Karas_Bedtime_Routine.jpg to see an example of the routine chart. I am the step-mom of two active boys. One who is 6 and one who is 9. 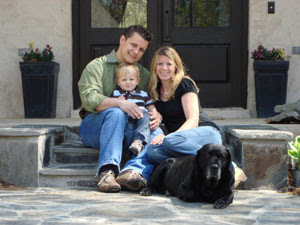 After I moved in a year ago, their father and I have been using your positive approach to raising our kids. Some days we are good at it and some days we have to go back to the books. I have two questions. You are always talking about appropriate consequences. Can you give a novice some specific examples for what appropriate consequences are? What can you do when your 6 (then 5 year old ) Kindergartner, who was never in day care, won't speed up in the morning and is in danger of missing the bus? My second question is a bit more complicated. It involves their mom. We have sole custody of the kids but she get visitation privileges every other weekend. There is no disciple when the kids are with her. They stay up as late as they want, eat nothing nutritious, talk back to her, fight with each other (All things they do not do when they are with us). Talking to her is not an option, so we do the best we can when the kids are with us. But sometimes is takes a full week to get the kids back to the routine after being with her. That we can kind of handle, but now summer break is here and they are going to be with her for 6 weeks total. (Off and on, we arranged it so the kids are not with her the full 6 weeks at one time.) So the question becomes, how do we keep positive discipline and all the things we have learned together going when they are in such completely different environments? The most rewarding part of my work is hearing from people who have found it so encouraging in their lives. I just happened to be answering the Positive Discipline phones when Tiana called about an order. She shared how thrilled she was with Positive Discipline, so I encouraged her to take the two-day workshop, Teaching Parenting the Positive Discipline Way, so she could learn even more and teach others. Tiana was excited about the idea. I asker her if she would also be willing to write down some of the things she said so I could share her enthusiasm for others. Imagine my joy when I received the following from Tiana. and others. I knew that every word I said, every expression my face and body displayed to him, was creating who this little person was going to be. I live in the deep south of Mississippi where "Spare the rod/ Spoil the child" is the way. As Lawson grew and started needing guidance I felt so much frustration, a loss of how to handle such things as hitting. After reading your book I felt peace, a since of calmness & hope. I now had direction. Things are so much better in my household and I just wish all children had parents with the knowledge of your positive ways. The world would for sure be a better place. I can't wait to get more involved in learning and possibly teaching others. Jane, you are a true gift to parents and mostly children. Thank you for all your hard work in educating us parents. I've decided to share an excerpt from Positive Discipline A-Z by Jane Nelsen and Lynn Lott on Hitting, so others can get an idea of what Tiana found so helpful—and so others can experience the format of this book that provides non-punitive solutions for just about every behavior challenge you can think of. Understanding Your Child, Yourself, and the SituationHow are we ever going to teach our children it is not okay to hurt others when we keep hurting them? We are reminded of a cartoon depicting a mother spanking her child while saying, "I'll teach you not to hit someone smaller than you." When children hit, it could be that their feelings are hurt. (Children can feel hurt or frustrated just because they can't get what they want – now!) You probably feel hurt and frustrated, too, because you want your child to treat others respectfully and may even worry that your child's behavior is a reflection on you as a parent. Perhaps you are overreacting and treating your child disrespectfully out of shame and embarrassment, trying to prove to the other adults around that you won't let your child get away with this behavior. Most likely your child simply doesn't have the words or skills to get her needs met and lashes out (hits) because she doesn't know what else to do. Toddlers are short on both language and social skills, and when they play together they can easily become frustrated. When they lack the ability to express what's wrong in words, hitting and other types of aggression sometimes result. It is developmentally normal for toddlers to hit. It is the parent's job to supervise and handle toddlers kindly and firmly until they are ready to learn more effective ways to communicate. Kids will grow out of it if they get help (skills training) instead of a model of violence (hitting back). Take the child by the hand and say, "It is not okay to hit people. I'm sorry you are feeling hurt and upset. You can talk about it or you can hit this pillow, but people aren't for hitting." With children under the age of four, try giving them a hug before removing them from the situation. This models a loving method while showing them that hitting is not okay. Hugging does not reinforce the misbehavior. You never really know at what age a child begins to understand language. For that reason, use words such as, "Hitting hurts people. Let's find something else you can do," even if you think your child can't understand. Show children what they can do instead of telling them what not to do. If you have a child that has a pattern of hitting, supervise closely. Every time she starts to hit, gently catch her hand and say, “Touch nicely,” while showing her how to touch nicely. When your preschooler hits you, decide what you will do instead of trying to control your child. Let her know that every time she hits you, you will put her down and leave the room until she is ready to treat you respectfully. After you have told her this once, follow through without any words. Leave immediately. Later you might tell your child, "That really hurts" or "That hurts my feelings. If I have done something to hurt your feelings, I would like to know about it so I can apologize. When you are ready, an apology would help me feel better." Do not demand or force an apology. When children are pre-verbal, take time for training without expecting that the training will “take hold” until they get older. (Lots of supervision is the main parenting tool for pre-verbal children – along with distraction and redirection.) Help her practice touching family members or animals softly. Show your child how to be gentle and say, “Pat, pat,” or “People are for hugging, not hitting.”(See Booster Thought 2 ) This does not eliminate the need for supervision until she is old enough to understand. Teach verbal children that feelings are different from actions. Feelings are never bad. They are just feelings. Tell your child that what he feels is okay, but it's still not okay to hit others, even if he is angry. He can tell someone, “I'm angry because____and I wish ________.” Help children brainstorm ways to deal with feelings that are respectful to themselves and others. One possibility is to tell people what he doesn't like. Another possibility is for him to leave the scene if he is being treated disrespectfully. Get your child involved in creating a Positive Time Out area. Teach her that sometimes we need time to calm down until we feel better before doing anything. Don't send her to time out, but let her know that she can choose her special time-out area any time she thinks it will help her feel better. Sometimes, when she doesn't want to use her special time out area, ask her if you can use it until you feel better – or create your own and model using it to feel better. Find ways to encourage your children with unconditional love and by teaching skills that help them feel capable and confident. Look around and see if there are ways you are hurting your child without realizing it. Are you sending your child to his or her room frequently, scolding and criticizing regularly, singling out the child when a problem occurs? If so your child may be feeling really hurt and upset and the hitting is a way to strike back at the world. Be more encouraging and positive and stop the hurtful behaviors and see if you don't notice a change in the hitting behavior. Life Skills Children Can LearnChildren can learn that it is not okay to hurt others. Their feelings are not bad and they are not bad people, and they can get help to find actions that are respectful to themselves and to others. They can learn that what they do doesn't define who they are. They are not a bad child because they hit, but the behavior is unacceptable. Be aware of the discouraged belief behind the misbehavior. A child who hits usually is operating from the mistaken goal of revenge with the belief, "I don't feel like I belong and am important and that hurts, so I want to hurt back." Children will feel encouraged when you respect their feelings and help them act appropriately. Many people use the biblical admonition "spare the rod and spoil the child" as an excuse for spanking. Biblical scholars tell us the rod was never used to hit the sheep. The rod was a symbol of authority or leadership, and the staff or crook was used to gently prod and guide. Our children definitely need gentle guidance and prodding, but they do not need to be beaten, struck, or humiliated. Don't hit your child to show an onlooker that you are a good parent and not going to allow your child to get away with something. Your relationship with your child is much too important for that. He: There are times when it is necessary to spank my children to teach them important lessons. For example, I spank my two-year-old to teach her not to run into the street. She: After you have spanked your two-year-old to teach her not to run in the street, will you let her play unsupervised by a busy street? She: Why not? If the spanking teaches her not to run into the street, why can't she play unsupervised by the street? How many times would you need to spank her before you would feel she has learned the lesson well enough? He: Well, I wouldn't let her play unsupervised near a busy street until she was six or seven years old. She: I rest my case. Parents have the responsibility to supervise young children in dangerous situations until children are old enough to handle that situation. All the spanking in the world won't teach a child until he or she is developmentally ready. Meanwhile you can gently teach. When you take your children to the park, invite them to look up the street and down the street to see if cars are coming and tell you when it is safe to cross the street. Still, still you won't let them go to the park alone until they are six or seven. Studies show that approximately 85 percent of all parents of children under twelve years old resort to spanking when frustrated, yet only 8 to 10 percent believe that it is dignified or effective. Sixty-five percent say that they would prefer to teach through positive methods to improve behavior, but they don't know how. This book shows you how. The Positive Discipline Association is a non-profit organization dedicating to promoting and encouraging the development of life skills and respectful relationships in families, schools, businesses and community systems. One of the services of this organization is to provide training workshops to accomplish their mission. Another is a panel of Certified Positive Discipline Associates who answer as many questions as they can find time for. I have asked permission to post a recent question and answer by Laurie Prusso. I think you’ll enjoy her warmth, her humor, her encouragement, and her practical suggestions. H. Stephen Glenn was a brilliant, charismatic person who was dedicated to Developing Capable Young People by helping adults become more capable in their skills for working with children. At the end of this post, you’ll find a link to listen to a sample from one of his CDs. Eventually we became co-authors. It began in 1983 when I gave him a copy of my newly, self-published Positive Discipline. I know he didn’t read it at that time, and I can understand why. If fact, I’m surprised that anyone did. I didn’t know anything about self-publishing, and that first printing was very funny looking with a two-color cover that I designed (not one of my talents), and was printed by a local printer who managed to misspell discipline and put it upside down on the spine. Still the first printing of 2000 was sold in a year. 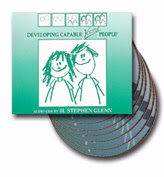 So, by the time I attend Steve’s Developing Capable People workshop in 1985, I had a fairly decent version of Positive Discipline and gave him another copy. That is what I said, but this is what I thought. “I can’t write another book. I’m not really a writer. I could never do this.” I did not believe I was an “author” until three of the books I wrote (including the one I eventually wrote with H. Stephen Glenn) sold very well. So, the idea sat on a shelf for a while. Meanwhile, Steve started using Positive Discipline as the text for his DCP workshops and keynotes he did all over the country. So, this self-published book started selling all over the country. Steve got so busy that he subcontracted with Positive Discipline Associates to handle his bookings. Cindy Botello eventually worked full time for Steve out of my offices. I kept printing Positive Discipline books because I was now getting orders from all over the country. Meanwhile, I decided to self-publish Understanding: Eliminating Stress and Dissatisfaction in Life and Relationships. Steve started selling this book also, and more orders poured into my office. I decided it was time to tackle the task of writing a book with Steve. What an adventure. It took me awhile to discover that Steve didn’t have time to write. He was excellent at speaking, and spent so much time on the road that he didn’t have time or energy left for writing. So I began the task of listening to his cassette tapes and trying to capture his charm and brilliance in writing. This was not as easy task. When you listen to his Developing Capable Young People CDs you will notice that his sentences are often three paragraphs long and may go in several different directions. Sounds great. Doesn’t read great. I’m very proud to say that I think I did a good job, but it was very time consuming. Steve kept promising that the book would be available in six weeks—and collected prepublication sales. Meanwhile, I’m listening to cassettes and writing 16 hours a day trying to meet the deadline. I remember one time I asked him a question and turned on my tape recorder. He talked for two hours and I had another chapter. Four month’s later; the self-published version of Raising Children for Success was hot off the press. Steve now had another text to use with his Developing Capable People Course (he continued to use Positive Discipline). Two years and 40,000 copies later, we sold the rights to Prima (eventually purchased by Random House) and they called it Raising Self-Reliant Children in a Self-Indulgent World. H. Stephen Glenn died in 2004 http://www.capabilitiesinc.com/about.html Fortunately we can still learn from Steve through his CDs, Videos, and Books. Click here to listen to a sample. I was watching an Oprah show last night when I heard her express something very similar to what I know and have written about in the following article. Getting Oprah on the bandwagon could certainly help get the message out. For those of you who may have read this article, I revised it this morning. How fine is “fine”? Fine is relative. Yes, most of us turned out just “fine.” We can laugh at some of the punishments we received as a child—and even say we deserved them. However, if we had been allowed to learn from our mistakes instead of being made to pay for them, is it possible we might be even better than “fine”? The group leader helped him explore this experience to help everyone in the class see if there might be a more productive way to handle this situation. Does everyone agree with Stan that he deserved the F? Would the F have been enough to teach him the consequences of his choices, or did he need the punishment also? What do you think, Stan? How did you feel about getting the F for cheating? I felt very guilty and very embarrassed. What did you decide from that? That I wouldn’t do it again. When we hear this, we may think, “See, it worked.” But let’s explore a little further and see how what may have seemed to “work” for the moment, may have had some harmful long-term results. Stan, what did you decide after receiving the whipping (punishment)? That I was a disappointment to my parents. I still worry about disappointing them. When I think about it, I realize how much I live in fear and self-doubt. So how did the punishment help you? Well, I had already decided I wouldn’t cheat again. The guilt and embarrassment of getting caught in front of others was enough to teach me that lesson. Actually, the worry about disappointing my parents is a real burden. If you had a magic wand and could change the script of that event, how would you change it? How would you change what anyone said or did? Who has any ideas you could give Stan? It is usually easier to see possibilities when you aren’t emotionally involved. What could Stan’s teacher or parents have done or said that would have demonstrated kind and firm discipline that would be effective short-term and long-term? I’m a teacher, and I’m learning a lot from this. The teacher could have taken Stan aside and asked him why he was cheating instead of embarrassing him in front of the whole class. Stan, what would you have answered to that? That I wanted to pass the test. Then I could appreciate his desire to pass and ask him how he felt about cheating as a way to accomplish that. I could honestly say that it didn’t feel good and would promise never to do it again. I would then tell him he would have to receive an F for this test but that I was glad he had learned that cheating doesn’t feel good and isn’t helpful in the long run. I would then ask him to prepare a plan for me about what he would do to pass the next test. I would still feel guilty and embarrassed about cheating, but I would also appreciate the kindness along with the firmness. Now I see what that means. of their choices through curiosity questions can be very empowering because this helps children think for themselves and come to their own conclusions in a friendly and supportive atmosphere. So Stan, now do you have any ideas how you could use your magic wand to change what your parents did? It would have been nice if they had acknowledged how guilty and embarrassed I felt. They could have empathized about what a tough lesson that was for me to learn. Then they could express their faith in me to learn from my experience and to do the right thing in the future. They could reassure me that they would love me no matter what, but that they hoped I wouldn’t disappoint myself in the future. Wow, what a concept--to worry more about disappointing myself than my parents. I find that very encouraging. Positive Discipline does not mean letting children “get away” with their behavior. Validating feelings instead of scolding or rescuing. Using curiosity questions to help children explore the consequences of their choices (how they feel, what they learned, what they can do in the future) instead of shaming them through lectures and telling them how they should feel, what they should learn, and what they should do. Having faith in children that they can learn from their mistakes and figure out what to do in the future when encouraged to do so in a friendly and supportive atmosphere. Inviting children to come up with a plan (focusing on solutions) to solve the problem. Most people turned out “fine” even if they were punished—and they might have learned even more had they received both kindness and firmness to learn from mistakes. Turning out “fine” isn’t the issue. Are you satisfied with “fine,” or do you want your children to have the kind of nurturing that helps them bloom into the best people they can possibly be? You nurture the best in your children when your methods meet the five criteria for Positive Discipline. Are you satisfied with having your children turn out “just fine,” or would you prefer that they feel capable and empowered to be the best that they can be?